If you think you nailed that interview or the recruiter said, "keep in touch," don't just sit and wait for the phone to ring with a job offer. Instead, be proactive. There are things you should do after a job interview that can increase the odds of getting a second interview or landing a job offer. Immediately after completing an interview, write up a summary of the questions you were asked along with your answers. This will preserve a record of your responses for future reference if you secure a follow-up interview. Also, note anything you wish you had said to your interviewer but didn't get the opportunity. That way, if you get a second interview, you can make a note to mention these items. A thorough interview assessment will also provide you with details to address in your follow-up communications. In addition, you’ll be able to identify any problem areas in your presentation, so you can improve them and be even more prepared for future interviews. At the conclusion of the interview, ask about the process moving forward. Will the interviewer be contacting candidates in a week for a second interview? Making a decision in ten days? Do they notify everyone who applied or just the successful candidates? Knowing what to expect will you can determine when to follow up and can reduce any anxiety you might feel about the whole interview and hiring process. Keep track of everyone you talked to during this process. If you were interviewed by multiple people, record any useful information or particular concerns raised by each person. Make a note of the interviewers' names and contact information or later ask the person who coordinated the interview for those details. Getting the names of everyone involved in your interview is crucial because you’ll want to follow up with a thank you for the interview note. A well-written thank you note helps make a great impression on your potential employers. Decisions about candidates are often made quickly, so it's important to send your follow-up email immediately, the same day if possible. You want your interviewers to remember you and these follow-ups can make a good impression. An assertion that you believe the position is an excellent fit and that you would welcome the opportunity to join their organization. Include a brief summary of one or two sentences indicating why the position is an excellent match given your assets and interests. Supply any additional information that will address areas of concern that you were unable to fully address during the interview. For example, you might want to include a work sample demonstrating your competence in a key area of employer concern. Express your appreciation for the opportunity to meet, and if possible, compose slightly different personalized emails for each person rather than just copy/pasting the whole letter. Note something helpful that was shared with you by each individual. This is a nice touch – you definitely want to leave a good impression on all parties involved and be memorable. In addition, consider forwarding a separate communication expressing your gratitude to any helpful support staff people you met. Those staffers have more influence than you might think when it comes to hiring decisions. You want as many people on your side as possible. It’s a good idea to think beyond the current position for which you’ve just interview because you're potentially creating a long-term relationship with this interviewer, even if you don't secure the immediate job opening. Review your post-interview notes and connect with your interviewer through LinkedIn by finding an opening for a connection based on a discussion that arose during your interview. Perhaps you mentioned a newspaper article relevant to their business that you'd like to forward, for instance. 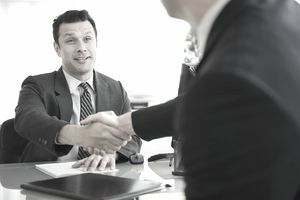 These connections are important because if you don’t get the current position, something might pop up later and the interviewer might make a connection with you. Having suitable references are going to be essential for your job search and you don’t want them to feel like they’re being cold-called by your potential employer. So, if you haven't already, alert your references that they might receive a call or email and summarize your case for the job and add in any points you want them to stress in their recommendation. In addition, If any of your strongest supporters have a contact within your prospective company, consider exploring their willingness to make an unsolicited endorsement on your behalf. People usually like to be helpful, but don’t forget to show appreciation for their endorsement with a follow-up thank you letter or email. In fact, sending a thank you note to all your references may be a good idea.